Enviromental activists warn us to take global warming seriously: we're creating a planet that many species will find uninhabitable. We're making consequential decisions about how we use our natural resources. We're changing the earth forever. Facetious Hummer drivers ask in response, "But really. Where can a guy like me fuel up? Reliably, I mean. With no potential loss of octane. It's hard on the motor to use lower-octane fuel. Causes pinging." But most of the rest of us harbor deeply-held sentiments somewhere in between: "Should I buy land in Minnesota? What's going to happen to weather where I live? Will the first floor of my house be accessible only via submarine? Will I have to look decent in a swimsuit in February?" We look to New Orleans as a harbinger of weather anomalies to come. The Gulf is just a teensy bit warmer and look what happened. And see how much the people in charge cared? We have every right to take it personally and be concerned. My partner thinks that global warming will be realized in San Francisco by more and more rain and cold weather. It won't just be cold in the summer; it'll be cold all year 'round. And it'll rain more. He attributes this recent spate of Seattle-like weather all down the coast to global warming. 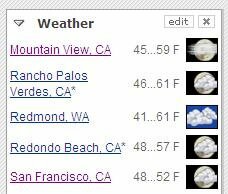 For days now I've looked at the weather forecast, and Redmond is 50 and rainy; San Francisco is 50 and rainy; Redondo Beach is 50 and rainy. I've tried to use the edit button on the weather (you can see it in the upper right hand corner) and it simply doesn't work; you apparently can't edit the weather. This lack of control worries me, so I set off looking for answers. What does global warming mean for ME in SAN FRANCISCO? Not for butterflies in the UK or nutria in the swamps of Louisiana, but for ME, ME, ME! It's not easy to find out, even with all this information at my fingertips. The NRDC promises drought and more intense rain. Both. "April through July of 1999 was the driest four-month stretch in 105 years of record-keeping in ... Rhode Island." And "Rhode Island ... got more than double [its] normal monthly rainfall in June 1998." Rhode Island isn't even very large and it's vacillating; how am I going to know what's going happen here? I look at Union of Concerned Scientists; maybe they'll give me the bad news. Gently. After all, they're concerned scientists, not mean scientists. They tell me that if we don't clean up our act, it'll get bad -- rising oceans, forest fires, mayonnaise typhoons, plagues of locusts and cell phones -- just what you'd expect. But they don't tell me whether it's going to be colder in San Francisco and rain more. That's really what I want to know. Santa Barbara is where the rain records are. Our icon seems to indicate that the Checkerspot butterfly has seen fit to flit in our vicinity; nothing about rain, low clouds, and unseasonably cold weather. Greenhouse gas emissions in Texas are the highest in the nation. Surprised? There's an increase in spots nationwide. I see 'em. Europe, as always, is going to be the trendsetter, just like it was with Techno. Unsurprisingly, like our President, Wikipedia maintains a neutral stance on the issue. This is actually depressing. I'm going to bed. Reminder to self: no blogging about the weather. Even though the Weather Channel offers round-the-clock non-narrative weather coverage, it shies away from controversy. And this is why: the more you read, the more depressed you become.